I'm not digging on our couch lately. 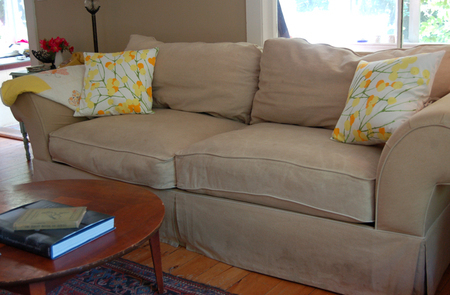 The couch we spent *forever* finding and agonizing over (and in the end, ended up with THE most basic of couches). I could tell you a million reasons why I strongly dislike it, but I'll spare you and save it for Steve (because he loves it when I talk about the couch. Ha!). I regularly stalk the aisle of my favorite antique furniture shops in hopes of a new (old) one. But only 6 years after buying ours, it seems both wasteful and expensive to replace it just because I don't love it anymore. For better or worse, I'm committed to my couch. And so...I do what I can to like it. Spread a little love on it, you know? Favorite quilts draped, and last week - new pillows in hopes of a little lift. I hesitantly cut into this amazing piece of Marrimekko that Katja sent me this spring. I've been treasuring it for just the right project, and this seemed worthy enough for the scissors - and I used every square inch of it that I had. I put the opening on the back, fully anticipating washing these (white!) 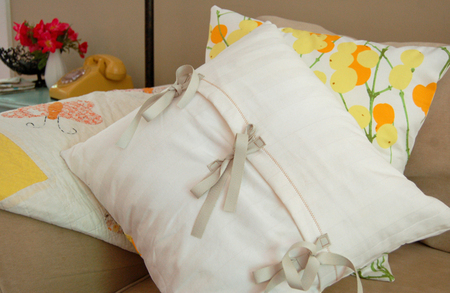 pillows often. I opted for ties instead of buttons this time, after my last set left button impressions on everyone's face who laid their head on the 'wrong' side. Oops. I was talking with a friend the other day about the lifespan of couches (because as 'not thrilling' as that conversation might seem, everyone has a couch story) - she thinks I'll soon enter a few years of 'tolerance,' followed by a slight fondness for it before it finally is time to get a new one. 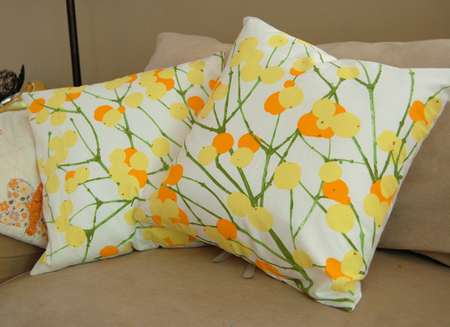 I think the pillows might have pushed me over into the tolerance phase - I like it much better now. Does that mean I'm closer to a new couch?